Carry your laptop and other essentials in the 17 inches Overnighter Trolley Laptop Bag. With 2-way zipper closures, deep pockets and comfortable and adjustable handle, the laptop bag securely holds your laptop in its padded slot for laptop up to 15.6 inches. Designed for on-the-go professionals, this trolley bag is great for everyday use and travel. 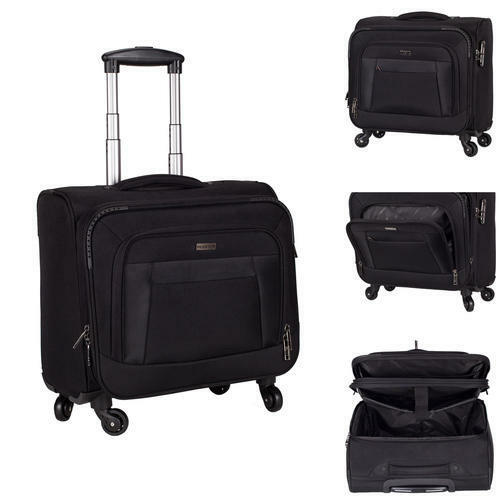 Smooth grip recessed carrying handle, Space for business files, Spacious organizer compartment includes key clips,phone,id,mp3 play pockets and more, Spacious overnight compartment fits clothes for 2-3 days. This Cabin Size Pilot trolley is spacious yet elegant design & light weight with strong built.